Configure your notifications, client permissions, email settings for issue tracker. Click to learn more about access privileges for configuring these settings. 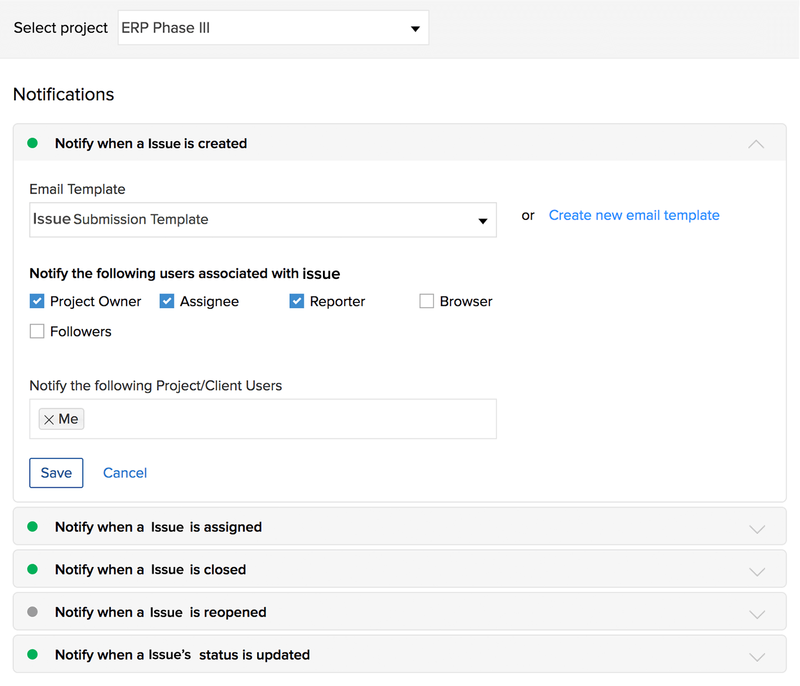 Notification pattern allows you to notify the respective project users about the details of the issue. You can notify the assignee, reporter or selected resources in the project. You can set the default notification pattern for issues. You can configure parameters like email settings, notifications and client permissions to track issues and set access privileges. You can enable notification emails when an issue is created, assigned, closed, reopened, etc. You can enable or disable the notifications. Configured notifications are highlighted in green. Also, click on the notifications to expand or collapse them. Choose or create an email template for your emails. Select the required option under Notify to. You can notify an Assignee, Reporter, Project Owner, and Followers. Click Save to send the notification mail. With Email Template, you can customize the notification mails to be sent. Learn More about Email Templates. If you want to check whether you will get notifications when new changes are triggered in the issue event, then you definitely need a notification search tool to filter your needs. Notification helper will help check if the user will receive email notifications on issue events or not. Click .in the upper-right corner. Select Notification Helper to search for the particular user or client in your portal. Select the User, Issue, and Notification Event. Click Submit to check whether the user will get notifications when the specific issue event is triggered. Portal users can access the Notification Helper from the Issues Edit page. Select the issue and click in the upper-right corner and select Notification Helper. Notifications will not be sent for changes made by the user itself. 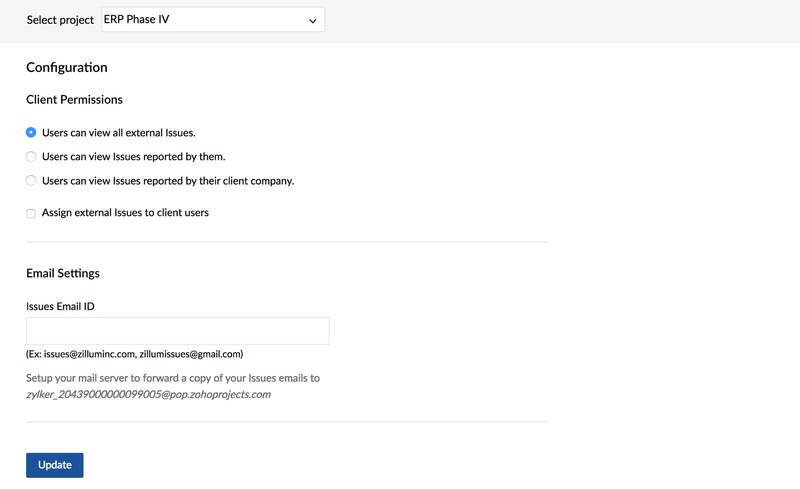 You can set client permissions and an email ID to receive issue related emails. Configure your client permissions and privileges. You can set the default client permissions to view the issues for the selected project. And you can collaborate with your clients and work on the issues. In Client Permissions, select the required permissions for the selected project. Issues can be assigned to client users only when Assign external Issues to client users is selected. Configure email settings, to forward issues to Zoho Projects from your configured mail ID. Email settings allow you to configure an email account as a POP account. In addition, add "@pop.zohoprojects.com" ID as a forwarding address in your email account. Enter your custom email ID in Issue Email ID to forward the issues. Click Update to save the email settings. And it will automatically generate your Zoho Projects POP ID to configure in your custom email account. In your custom email, select the settings icon. In the field that is used to forward emails, specify the generated Zoho Projects pop account ID (@pop.zohoprojects.com). A verification code will be filed as an issue in your Zoho Projects account. Copy this code and configure in your custom email account settings to verify and sync your custom email and Zoho Projects pop account. After this configuration, any mail addressed to your custom email account will be filed as an issue in Zoho Projects. As a sample, we have configured Gmail and Zoho Projects. Navigate to Settings in your Gmail account.. Choose the Forwarding and POP/IMAP tab. Specify the generated Zoho Projects pop account ID under Forwarding.